I can’t recall if I read somewhere on Buzzfeed or another website about smoking avocados and it got my quite curious. Smoking is a great way to add extra flavour to a dish. And you don’t even need a fancy smoking machine to be able to do it at home. All you need are wood chips, a non-sticking pan, small roaster and a good hood with preferably a window open. The first time I smoked chicken my house smelled like burned wood for a few days, because I forgot to put the hood on. What’s also convenient about this recipe is you can have some extra flavour to your avocado in minutes. Combine this with a waffle with a few drops of liquid smoke and you got a really smoking dish perfect for breakfast. Happy Waffle Wednesday everyone. 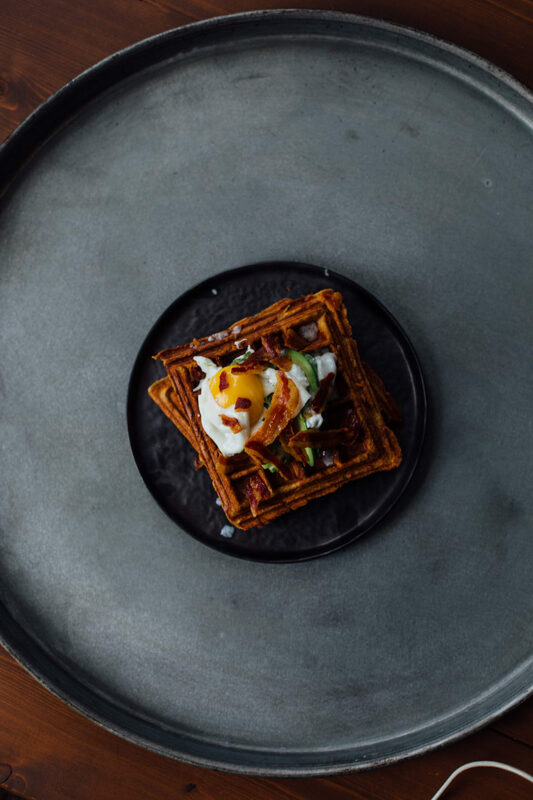 For the waffle recipe combine the low-fat quark, Worchester sauce, liquid smoke, baking soda, sugar, salt and one of the eggs to a bowl and mix together until you get a firm batter. Set this aside. Heat up the frying pan on high heat and add in the wood chips with the tea. Mix this through until it gets warm and continue heating till it starts to smoke. Slice the avocado through and discard of the seed in the middle. Scoop out the avocado with a spoon and make thin slices you place on a small plate. When enough smoke starts to come out of the pan and the wood chips start to darken place in the roaster with the plate of avocado on top. Place the lid on the pan, but place it slanted so enough smoke escapes to prevent condensation. Turn down the heat a little and let this smoke for about 5 minutes. 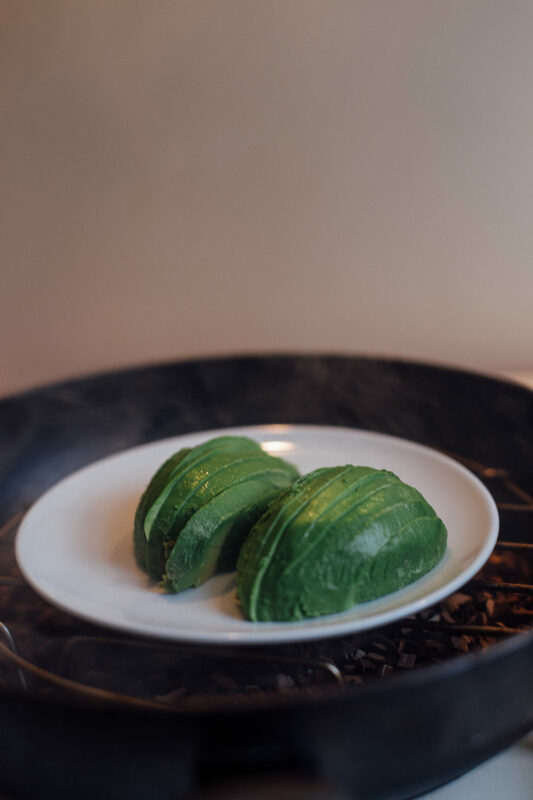 Be careful the avocado doesn’t start to turn brown while smoking because the flavour will get too intense. Use an oven mitten to get the plate out of the pan and set this aside while we continue with the waffles. Heat up your oven to 220℃ and place the slices of bacon on some baking paper and place in the oven for about 10 minutes until crisp. Heat up your waffle iron and bake your waffles using about two tablespoons of batter for one waffle. When done place the waffles in the oven so they won’t cool down too much. For the final step grab a pan with enough water in it and heat up until it boils. Tick an egg in a cup and put this next to the pan with boiling water. Stir your water in the pan until you get a small vortex and put in the egg we had in a cup. This for me is the easiest way to make a poached egg. Boil this for 3 minutes before taking it out. 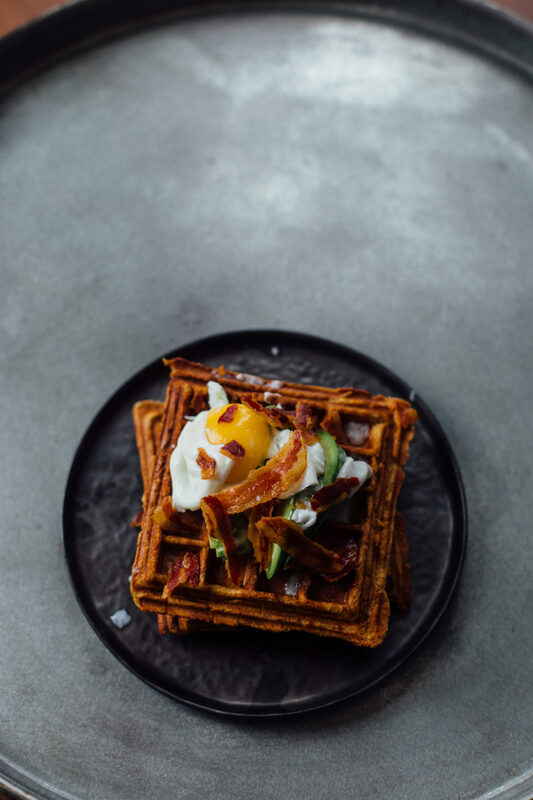 Serve the waffles with the smoked avocado, bacon and poached egg. Enjoy!